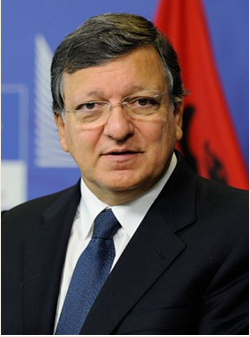 The Honorable José Manuel Durao Barroso, is the former president of the European Commission. Barroso, former prime minister of Portugal, became president of the European Commission in 2004 and was reelected to the post in 2009. The European Commission is the executive body of the EU and is responsible for proposing legislation, implementing decisions, upholding the Union’s treaties and the day-to-day running of the EU. After graduating in law from the University of Lisbon, Barroso completed a diploma in European studies at University of Geneva’s European University Institute and a master’s degree in political science from the Department of Political Science, Faculty of Economics and Social Sciences at the University of Geneva, earning an honors in both. He then embarked on an academic career, working successively as a teaching assistant at the Law Faculty of the University of Lisbon, a teaching assistant in the Department of Political Science, University of Geneva and as a visiting professor at the Department of Government and the Walsh School of Foreign Service at Georgetown University. In 1995, he became head of the Department of International Relations of Lusíada University in Lisbon. Barroso’s political career began in 1980 when he joined the Social Democratic Party (PSD), a major social-democratic political party in Portugal. He was named president of the party in 1999 and was re-elected three times. During the same period, he served as vice president of the European People’s Party. As state secretary for foreign affairs and cooperation, he played a key role as mediator in the signing of the Bicesse Accords, which laid out a transition to multi-party democracy in Angola in 1991, and, as minister for foreign affairs, he was a driving force in the self-determination process in East Timor (1992-1995), a country in Maritime Southeast Asia. Under his leadership, the PSD won the general election in 2002, and Barroso was appointed prime minister of Portugal in April of that year. He remained in office until July 2004 when he was nominated by the European Council and elected by the European Parliament to the post of president of the European Commission.